According to a new book, the key is “emotional agility”: being less rigid and more flexible with our thoughts and feelings. “We act like wind-up toys, repeatedly bumping into the same walls, never realizing there may be an open door just to our left or our right,” writes Susan David, a psychologist at Harvard Medical School, in Emotional Agility: Get Unstuck, Embrace Change, and Thrive in Work and Life. Negative emotions can be clues to our deepest values, and the ways in which we may have gotten off track. Her book is a guide to life’s trickiest emotions: not how to avoid them but how to learn to move through them. If we have the courage to do this, she argues, we will cultivate deeper relationships and a more authentic life. When we get stuck—i.e., held in thrall of a particularly nasty feeling—there are a few common culprits, writes David. Monkey mind: We’ve spiraled off into a cascade of regret about the past, worry about the future, or judgments about ourselves. Righteousness: Our need to be right leads to conflict with others, rather than forgiveness and understanding. Blaming thoughts for behaviors: Because we think certain things—“I always choke”—we feel compelled to take certain actions, like avoiding public speaking. We fail to recognize that we could choose a different path. The way we cope with negative feelings often serves to keep us stuck. Some of us bottle our emotions, trying to ignore them and soldier on. In the process, we end up stressing out the people around us and may find those feelings “leaking out” in other ways: anger at a cashier, for example, when our real anger is directed toward someone else. In contrast to bottlers, brooders rehash feelings over and over in their heads, not generating productive insights but simply reliving the pain. Brooders can become very self-focused, writes David, and they may start to judge and blame themselves for their feelings. Finally, sometimes inspired by the self-help industry, many of us respond to negative emotions by forcing ourselves to be positive. “This isn’t such a big deal,” we might tell ourselves, or “I should feel grateful for everything I have.” Yet trying to reason away our negative emotions and feel good all the time can be detrimental to our mental health. David calls these unhealthy responses being “hooked.” The feelings have snagged us, in one way or another: We aren’t aware of them yet they’re influencing our behavior; we’re completely drowning in them; or we’re constantly fighting them off in order to stay chipper. To get unhooked, we first have to acknowledge the hook—in other words, to be mindful and accepting of our feelings, David explains. In one study, for example, researchers found that smokers were more successful at quitting after participating in a program based on accepting, observing, and detaching from their cravings. Other research shows that people with alexithymia—who cannot put their feelings into words—have poorer mental health, less satisfying jobs and relationships, and more aches and pains. And naming your feelings isn’t as simple as saying “I’m stressed,” explains David; often, underlying such generic feelings are more uncomfortable emotions like frustration or hopelessness. The point of identifying these feelings is not to beat ourselves up, though. In fact, if we want to make improvements in the future, the best approach is self-compassion. With the clarity it brings, we can try to understand what the feelings are telling us—what we can learn about our desires, boundaries, or needs. David recounts a time when she was traveling for work and, alone in a fancy hotel room, began to feel guilty for leaving her family. Rather than getting hooked by the guilt and smothering her feelings with five-star room service, she instead chose to pause and learn from it: to remind herself how much she values time with her loved ones, and to recommit to prioritizing them. In one coaching exercise, David invites a group of participants to write their deepest insecurities on a name tag—“I’m boring” or “I’m unlovable”—and introduce themselves to everyone else, as if at a party. Somehow, putting our feelings into words gives them less power. One way to get some perspective on a difficult feeling is to use language—to say, “I’m having the thought that…I’m a bad mother” or “I’m having the emotion of…shame.” In one coaching exercise, David invites a group of participants to write their deepest insecurities on a name tag—“I’m boring” or “I’m unlovable”—and introduce themselves to everyone else, as if at a party. Somehow, putting our feelings into words gives them less power. Looking at our predicament from another person’s perspective is another way to gain some distance. For example, what would my friends think? They probably wouldn’t say you’re an incompetent employee and a poor excuse for a spouse. Eventually, by sitting with our feelings in this way, they may pass—along with the fatalistic stories we’ve concocted in our heads. That doesn’t mean they won’t ever return, but we’ll be more prepared if they do. Emotional agility sets us up to thrive in life, David argues. Negative emotions can be clues to our deepest values, and the ways in which we may have gotten off track. Loneliness reminds us to make time for our relationships, for example, and anxiety might mean we’ve taken on too many projects. Once we’ve identified these inconsistencies, we can make small course corrections to point us in the right direction: setting up a weekly dinner with friends, for example, or deciding to say no to commitments in the near future. 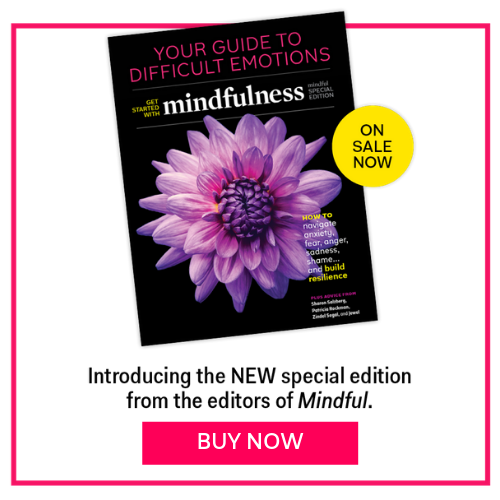 If you’re familiar with mindfulness research, parts of David’s book will probably sound familiar. But where she adds value is in the step-by-step explanation of what to do in those mindless moments of pain that we all know too well. Eventually, we can honor our feelings but not be ruled by them.